After the invasion of the Czechoslovak Socialist Republic, the Estonian Communist Party (ECP) also instigated meetings of party members and workers in support of the Czechoslovak occupation. 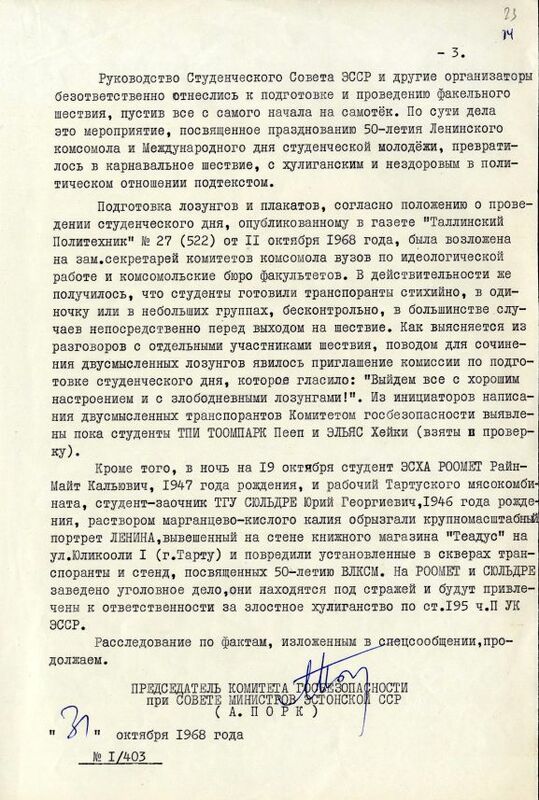 USSR Information Agency lies about invading officers having friendly discussions with Czechoslovak citizens on August 22, 1968, were repeated at these meetings. But the ECP could not conceal the discontent with the occupation of Czechoslovakia felt by a part of Estonia's population. Leaflets with “Moscow -- get your hands off Czechoslovakia. Down with Red Munich! Long live free Czechoslovakia!” were found in Tallinn and Kohila on August 23, 1968. On October 19, 1968, a university student torchlight parade dedicated to the Communist Youth Organization took place in Tartu. Alongside the parade students carried two posters with the inscriptions “The phantom of Communism roams across Europe” and “People, be vigilant!” On one of the posters was a tank with a red star; its gun was positioned so that it pointed towards a Czechoslovak “Jawa” motorcycle being driven nearby. Two students from this October 19 demonstration - Rain Mart Roomet and Jüri Süldre - were tried and charged with hooliganism. Another protest by university students took place in Tallinn on October 28, 1968. On a poster Jaroslav Hasek's character Svejk sat on a cloud and menacingly approached a Soviet soldier standing below him. Disturbances also took place in 1972 in the dormitories of the Tallinn Polytechnic Institute when students there sympathized too passionately with the Czechoslovak hockey team. 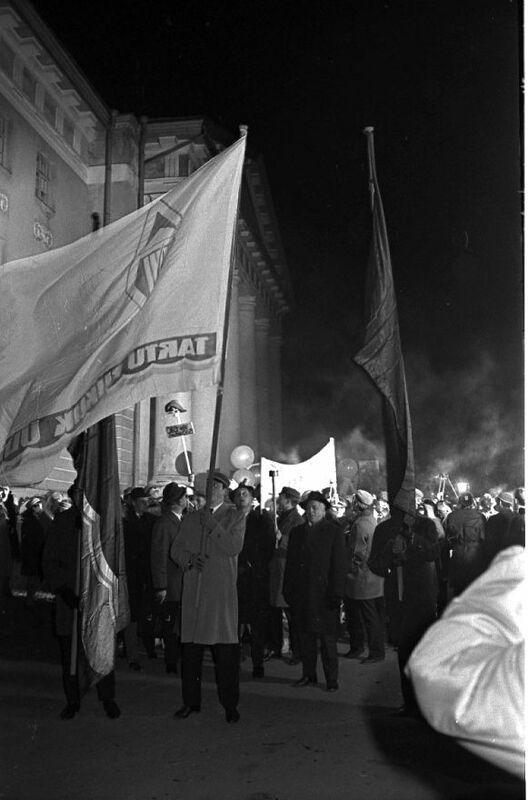 Students at the torchlight parade in Tartu on October 19, 1968. Some of the participants carried posters condemning the occupation of Czechoslovakia. Estonian Film Archives, FA-97158. Photographed by A. Alla. 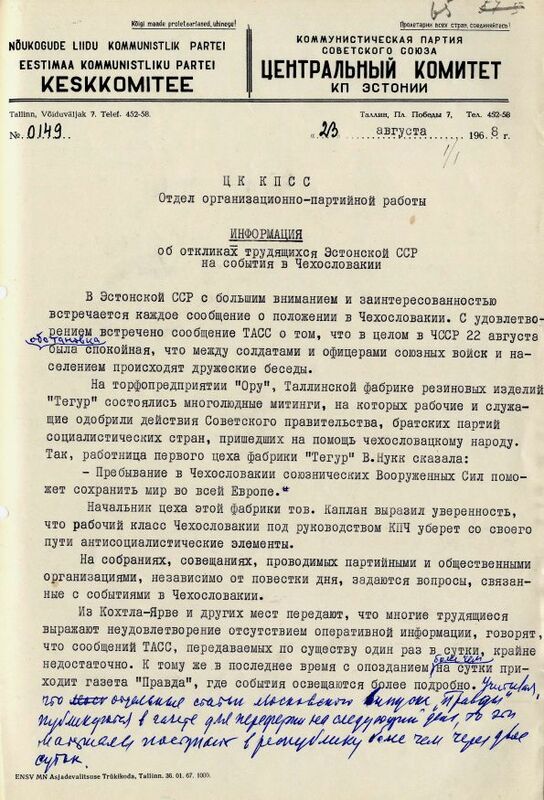 The August 23, 1968, report by Johannes Käbin (leader of the Estonian Communist Party) to the Central Committee of the CPSU regarding the citizens' response to the events of 1968. 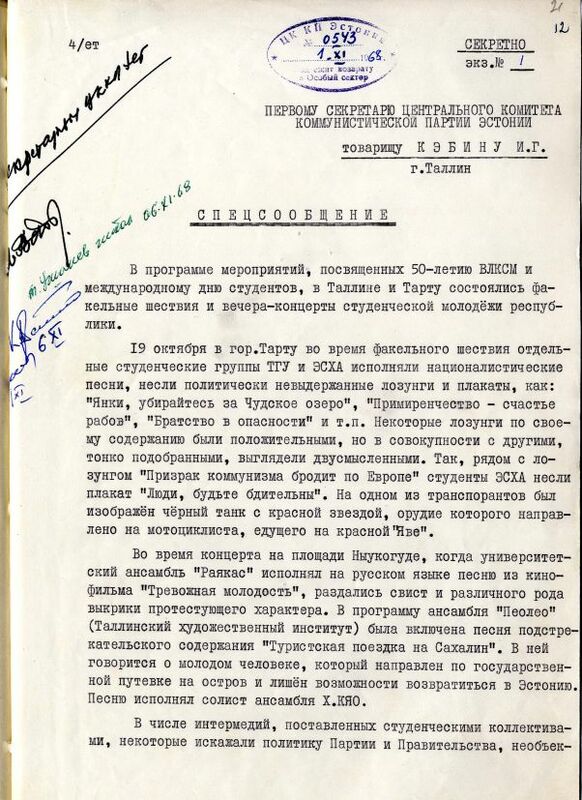 The report states that leaflets with “Moscow - get your hands off Czechoslovakia! Down with Red Munich! Long live free Czechoslovakia!” were found on August 23, 1968, in Tallinn and Kohila. State Archives of Estonia 1-302-68, pp. 65 – 66. 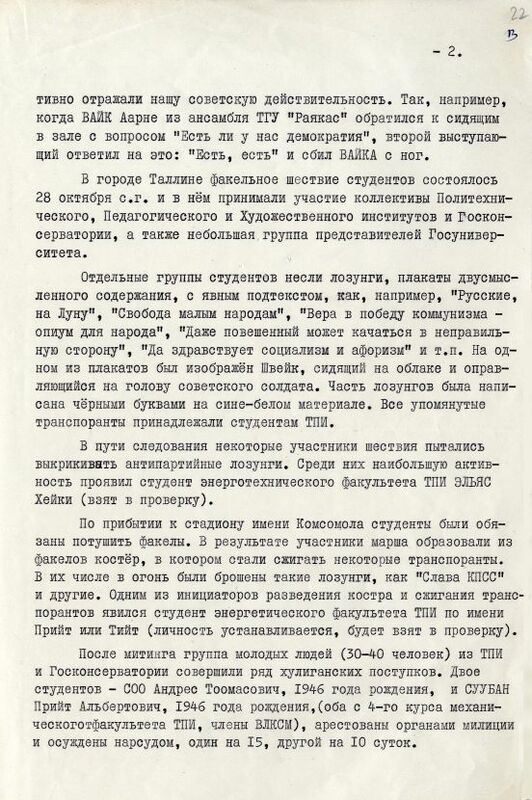 The October 31, 1968, special report by the KGB of the Estonian SSR to Estonian Communist Party leader J. Käbin regarding the torchlight parades in Tartu and Tallinn on October 19 and 28, 1968. The report states that students marching in the parades carried posters condemning the occupation of Czechoslovakia. State Archives of Estonia 1- 5- 110, pp. 21. – 23.